Gridwall acrylic accessories are perfect for showing your products with its clear material. They highlight your product rather than the display itself. Whether you need to display literature, candies, signs, brochures, jewelry, and many more will fit perfectly in these gridwall acrylic accessories from American Retail Supply. These gridwall acrylic displays will not drop any products like our wire baskets. 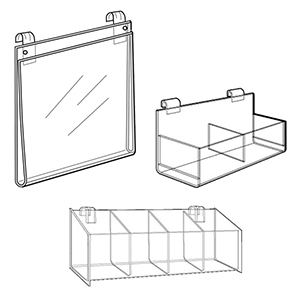 We even have acrylic accessories for slatwall and other wall systems. American Retail Supply has been supplying store supplies for years and always get excellent feedback on our customer service. Give us a call for any questions or order from a LIVE rep.